Image courtesy of the Gerald R. Ford Presidential Library and Museum A 13-term Representative, Gerald R. Ford was appointed Vice President on December 6, 1973. Ford became President on August 9, 1974, when Richard M. Nixon resigned from office. 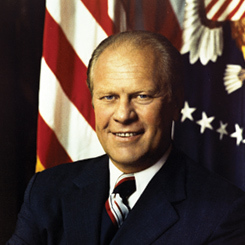 On this date, Representative and President Gerald R. Ford was born in Omaha, Nebraska. First elected to the U.S. House of Representatives in 1948, the Michigan Congressman served 13 consecutive terms, rising to the post of House Minority Leader in 1965. In December 1973, upon the resignation of Vice President Spiro Agnew, Ford became the first to be nominated to the Vice Presidency by the President under the 25th Amendment. Nearly 10 months later, Ford assumed the presidency when Richard M. Nixon resigned on August 9, 1974, in the wake of the Watergate Scandal. Ford served the remainder of Nixon’s term, but lost his re-election campaign in 1976. Upon the Michigan lawmaker’s death on December 26, 2006, Representative John Dingell of Michigan, who served with Ford in the House, remembered his friend for the personal qualities that endeared him to so many colleagues from both parties. “Jerry was warm, gentle, friendly, pleasant courteous individual,” Dingell recalled. “He never used bad language, he loved his family, his kids and above all else he loved Betty.” The House and Senate extended President Ford a final tribute by resolving to have his body lie in state in the Capitol Rotunda from December 30, 2006, to January 2, 2007.